The religious hierarchy as well as social-cultural setup of the Alavi Bohras is essentially and traditionally Faatimid and the whole community is headed and governed by the chief authority of Da’i-e-Mutlaq who is appointed by his predecessor in office. The Da'i appoints two others to the subsidiary ranks of Ma’zoon (licentiate) and Mukaasir (executor). 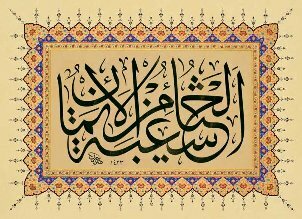 Ma’zoon (licentiate) means the person on the status of ‘izn’, one who takes oath and calls his subjects into the folds of Isma’ili faith. Mukaasir (executor) means the person on the status of ‘kasr’, one who is well versed with the false faiths of other sects and he removes doubts of his subjects by furnishing appropriate proofs of the truth. These positions are followed by the rank of Ra's ul-Hudood, Hadd-saheb, Miya-saheb, Shaikh-saheb and Mulla-saheb, who are appointed by Da’i-e-Mutlaq to perform varied Da’wat duties as per his learning, capability, efficiency and merits. Apart from all lower positions of different ranks (sahebs), the post of Ra's ul-Hudood is occupied by a highly educated and influential person who implements strict discipline in his subordinates and takes accounts of the execution of responsibilities from his lower ranks and reports the same to his upper ones. The residence of the Da’i-e-Mutlaq is named as ‘Devdi Mubaarak’ or ‘Markaz-e-Da’wat’ i.e. the centre of the mission. All the spiritual activities (ruhaani umoor) of the followers right from his birth till his death is executed from this centre like the ceremony of giving names to a new-born, taking oath of allegiance from an adolescent boy/girl after giving him required preliminary religious knowledge, taking lectures on theology and spirituality among selected followers, conducting Nikaah, carrying out Talaaq proceedings, settling internal and family disputes, arranging for burial rites, seeing the bad-good omen (fa’l)through Qur’an, fixing of engagement (nisbat) between prospective boys and girls etc. Near the centre, there is the Main Mosque (al-Masjid ul-Jaame’) where Da’i or Ma’zoon leads the daily prayers (namaaz), Friday prayer, prayer of the first night of every Islaamic month, prayer of the midnight (nisf ul-layl) in Ramazaan, prayer of important days-nights, prayer of Eid, prayer of the deceased (janaazah) etc. Today, the centre of Alavi Bohras is Vadodara where Da’i resides and apart from the Main Mosque there are other mosques and community halls which are looked after by Da’i himself. By the order of Da’i, persons (aamil) from the ranks of Da’wat are fixed to lead the prayers, meet the people for their personal assistance, handle different committees and help in exercising the Isma’ili faith properly. The Aamil or Saheb-e-Razaa, who is appointed by the Da’i-e-Mutlaq in a place where a sizable population of Bohras exist, is granted the permission to perform the religious ceremonies of the believers. He also leads the local congregation in religious, social and community affairs and has the responsibility to impart religious knowledge and train the people as per community traditions. Mainly in the month of Moharram or Ramazaan or when the need arises, the authoritative person be it a Da’i, Ma’zoon, Mukaasir or Ra's ul-Hudood visit those places controlled by Aamil and administer the community affairs, settle the internal conflicts and give important guidelines for welfare and education. Such towns normally have a mosque and an adjoining assembly hall (jamaa'at-khaana) where socio-religious functions are held. The local committees manage these properties and oversee the social and religious activities of the local Bohras which they directly report to the central administration of the Da'i through the local Aamil. Unfortunately, Alavi Bohras are misquoted as Aliyya Bohras in historical and cultural accounts, especially by the people who were hostile and hateful to them to be called by the name derived from Ali. Hence it was their deliberate attempt to call the Alavi Bohras by misnaming or mispronouncing the name Alavi. But now through the website the World knows them by Alavi Bohras – as a distinct community centered in Vadodara. They have their unique religious, social, cultural, financial, educational setup and have well-knitted administration independent of any sectarian influence.